Hello Again -- and Welcome Back. For the first time we can offer Aroy-D all natural pure coconut cream in the small box, Thai Ketchup if finally back in stock, Namprik Thai Tae is here again, Green Label som tum sauce from Mae Pranom, and freshest fried Thai garlic and shallots have also just arrived. Our feature Thai recipe is Sen Mee using Wai Wai noodles. Thanks for visiting! Namprik Thai Tae means Real Thai Namprik. Loaded with flavor: a combination of salty and spicy, from dried shrimp and crushed chilli peppers. We just received a small shipment from Thailand. Freshest stock, just arrived yesterday. All natural coconut cream in the small 8.5 oz box is a new product from Aroy-D, as previously it was only available in the larger 33 oz boxes. Nothing can match the perfect balance of sweet and hot like this Thai ketchup. Typically from Mae Pranom you get the very best taste. 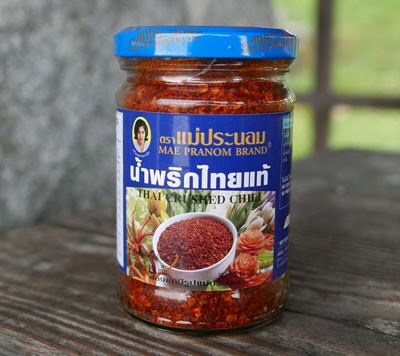 The consistency is very similar to an American-style ketchup, and you get a nice sharp Thai chile heat. Many street vendor chefs in Thailand use Thai Ketchup also, you might be surprised. The Green Label has been out of stock for several months, it has the stinky fermented fish flavor that non-Thais usually don't like very much. We just got a new shipment of this and it's as fresh as can be. All Natural. Very high quality fried garlic. Fresh and fragrant. Large container will go a long way. Thai garlic is especially aromatic, and adds fragrance as well as flavor. Brand new fresh stock just arrived yesterday. This is brand new stock just received from Thailand from Aroy-D. Quality is excellent. These are highly sought after among restaurants who prefer fried Thai shallots for the excellent bold flavor. This is usually added to soup or stir friy, and it can be eaten as a snack. The 9" size was sold out for about a year and we only got a few dozen last shipment. It takes one worker two days to make one of these by hand, so at our asking price it's very reasonable considering the extreme hardness of the granite and all the work that goes into it. Probably not suitable for people with small kitchens because it's larger and heavier than you may expect, but if you might like to have one please check it out before it's too late. Not spicy, and the noodles have a great consistency. Rice vermicelli blends well with vinegar, sugar, thin soy and black soy sauce in the wok, the result as shown is a healthy and tasty noodle dish. Rice vermicelli noodles, also known as 'sen mee' in Thai, are delicious and easy to prepare, made by Wai Wai which is the premium manufacturer in Thailand. So many Thai recipes use Sen Mee, and cooked Sen Mee is a great substitute for jasmine rice. I am hesitant to jump in and try to cook Thai food because it sounds so different from the way I am used to cooking, but I would love to try it. Is there a book you can recommend?